The Miami startup Creating Revolutions was experiencing double-digit product rejection rates in the assembly of their hospitality service pager technology. 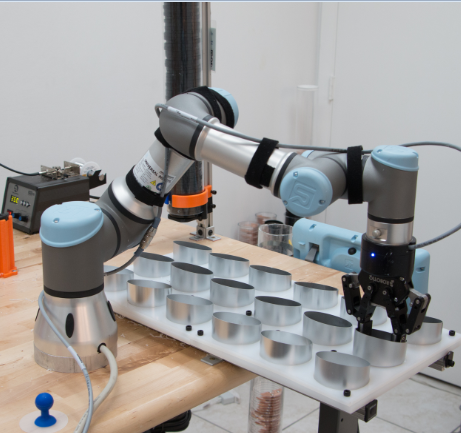 The collaborative UR3 robot now handles soldering, drilling, silicone dispensing and light assembly while being controlled and monitored in a cloud-connected system, reducing rejects to near zero while increasing production efficiency almost five-fold. Creating Revolutions makes a customer service paging system for the hospitality industry. The hockey puck sized Communication Disc connects guests with their waiter through their smart phone wirelessly connected to the Communication Disc. Assembling the disc is a complex tasks requiring great accuracy and repeatability. "The problem is you can't efficiently repeat a specific process the exact same way over and over again as a human being," says Einar Rosenberg CEO of Creating Revolutions, who was on the lookout for an automation solution that could meet both quality and quantity requirements. “Those two elements are always at a battle with each other. We looked at about 40 different robot companies, and most of them didn’t have a very good way to program them; they required too many things for the environment; or they were too big or too jerky,” says Rosenberg who concluded his research by choosing a collaborative UR3 robot from Universal Robots. The UR robots are classified as collaborative due to their built-in safety system that makes the robot arm automatically stop operating if it encounters objects or people in its route. This feature enables humans and robots to work side-by-side with no fencing as is usually required with traditional industrial robots. “We need to have humans feeding the robot parts. The safety features of the UR3 actually simplifies a lot of that, so that we feel more secure about our most valuable asset—which is not the UR3 but our people,” says Rosenberg. Einar Rosenberg (right) discusses the assembly process with Matt Bush (center) and Rob Goldiez (left), founders of Hirebotics, who integrated the robot on the production line. The UR3 was integrated in Creating Revolutions’ assembly line by Hirebotics, a Universal Robots Certified System Integrator that basically works like a staffing agency for cobots, letting startups like Creating Revolutions rent cobots by the hour without any upfront capital expenditures. Hirebotics handles all programming, deployment and maintenance of the machine, while Creating Revolutions pays for only the hours it's operable. “Our premise behind starting Hirebotics is that all manufacturers know how to hire people, so we wanted to make hiring a robot as easy as hiring a person,” says co-founder of Hirebotics, Matt Bush. The concept appealed to Creating Revolutions. "We're a startup so we couldn't afford a very expensive robot," says Rosenberg. “With a traditional robot and a traditional setup of somebody in-house, the expense and the complexity—we are basically changing all of that. The UR3 handles two different cycles: first, the robot checks row by row that the aluminum housing parts are lined correctly on a tray. The robot then picks up the part, places it into a clamp, picks up a silicone injector and aligns the silicone on the inside edge of the housing. Placing down the injector, the UR3 picks and places an acrylic disc on top of the silicone. “The robots then does a process we call “the twist,” because, no matter what, we found that the silicone never reaches a perfect circle. To spread it equally, the robot uses a suction device to press down and twist the acrylic disc, thereby spreading the silicone perfectly before placing the assembled part back on the tray,” explains Rosenberg. The UR3 is equipped with a Robotiq gripper that is placed in the center of each housing part. The gripper spreads its fingers out to check if the part is there. If the fingers are stopped by the periphery of the housing, it senses the housing and continues on to check that the next one is positioned correctly before the assembly process begins. 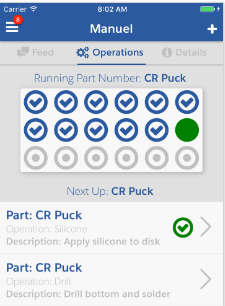 In their mobile app, Creating Revolutions has an animated version of the tray layout enabling them to follow the UR3 probing each part and whether it’s completed. The company has jokingly nicknamed their robot “Manuel” after Panamanian dictator Manuel Noriega. The other cycle that the UR3 is preprogrammed for is the drilling and soldering process. The robot picks a disc with a copper base out of a dispenser, and places it into an optical laser sensor that aligns the disc, then the robot places the disk into a holder, affixing it by closing two clamps. “Next step is the UR3 grabbing a drill from the utility belt followed by sort of peck drilling process, because the acrylic shatters if you just force it. The robot is sensitive enough to basically pop it in until it makes a perfect hole,” says the Creating Revolutions CEO. 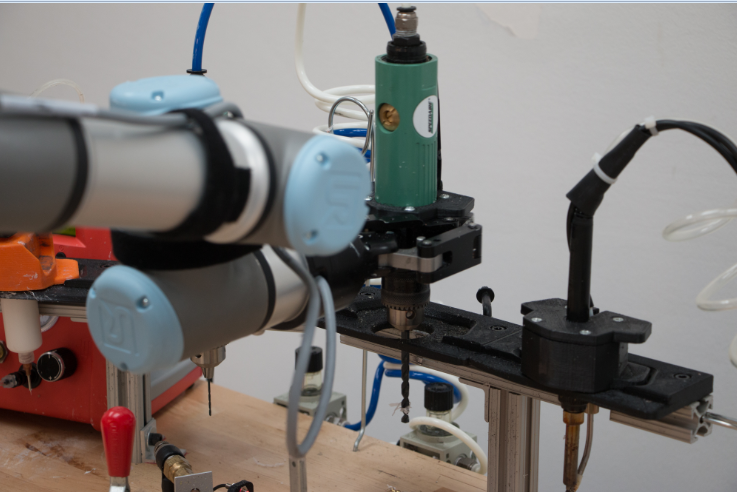 With drilling complete, the robot places the drill back into the utility belt and releases one of the clamps, allowing an open area where the soldering iron with an automatic soldering feeder can come in. Back at the utility belt, the UR3 grabs the soldering iron, putting three points of pre-soldering right on the copper and around the hole that was drilled. Once that’s completed, the robot flushes out any debris by puffing a bit of air, unlatches the second clamp; grabs the disc and places it into another tube with completed parts. “Having the UR3 perform the pre-soldering has increasing the efficiency of the process almost five-fold,” says Rosenberg. Instructing the UR3 to change tasks just requires a QR code scan. It only took a few weeks from when Creating Revolutions first got in contact with Hirebotics until the UR3 was ordered, installed and programmed. Matt Bush, co-founder of Hirebotics, explains that in order to run a “robot staffing agency” quick deployment is imperative. “What has enabled us to do that is the ease of programming the UR robots. 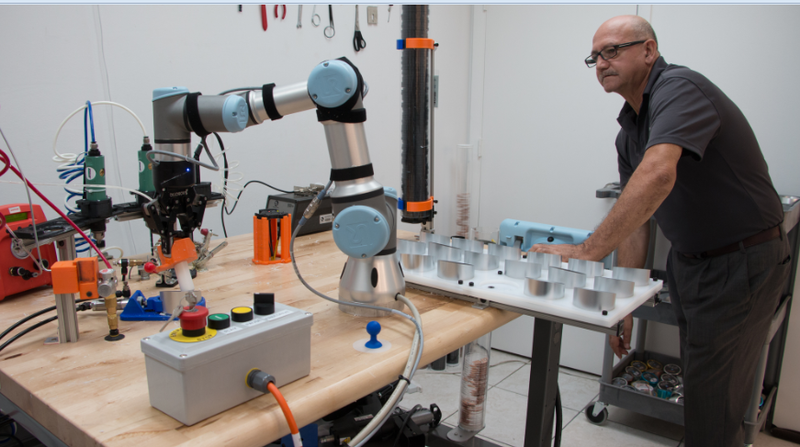 The UR interface makes it simple to get it up and running in production much faster than a lot of the other solutions we have worked with in the past,” says Bush, explaining that contrary to traditional robots there is no need to change existing layout of the work cell as the collaborative robots usually don’t require additional safety fencing. 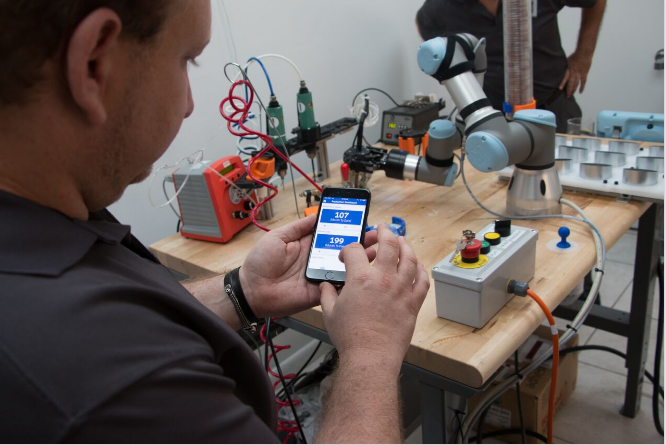 Hirebotics also provides a smartphone interface that enables customers to monitor their UR robots’ performance as well as receive ongoing technical support. 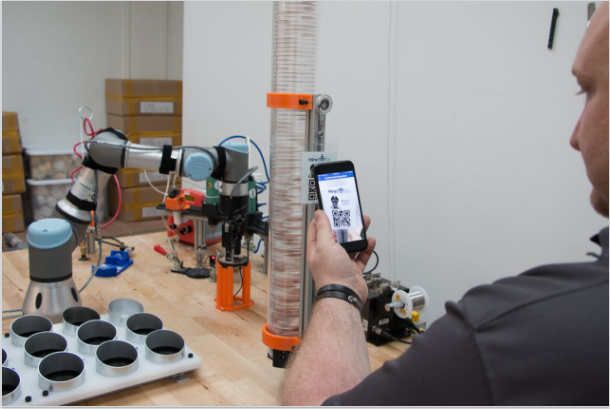 Performance data is streamed from the robot as events occur and can be monitored in the Hirebotics mobile app with real-time charts for quick insight into exact production numbers. Web cameras show what’s happening on the production line, allowing customers as well as Hirebotics to monitor activities at all times. “By gathering details on the number of units that the UR3 produces in a given period of time, we can combine all data and create realistic, very accurate forecasts of our production needs, such as how many humans are needed and what we need to focus on to produce at optimal levels,” says Rosenberg. Einar Rosenberg, CEO of Creating Revolutions, receives real-time data on how many units the robot has produced directly on his phone. Initially anxious about the arrival of a robot colleague, the employees now look at the UR3 as part of the team. In addition to functioning side-by-side with human workers during the day, the UR3 continues to perform for hours after workers go home at night, preparing parts for further assembly the next day. Having a robot perform several assembly steps has become a huge selling point for Creating Revolutions. Hirebotics uses TCP/IP for connection to the cloud infrastructure that the company has built to monitor its UR robots in the field. Hirebotics also use this cloud connector for implementing other services into the cell such as cameras or customers’ equipment. This setup gives Hirebotics more control to alter how they are using the equipment without the need to update the robot operation or program. “Utilizing standard architecture such as TCP/IP socket communication or XML remote procedure call (RPC) gives us a large library of well-tested and stable frameworks to choose from, as well as the ability to quickly expand the functionality of the robots in the field. We are then able to use this on previously installed robots and quickly provide enhanced functionality or monitoring in the field,” says Bush, emphasizing that though UR robots are touted as user-friendly with a very intuitive touchscreen interface, it’s possible to dive much deeper into the system and use advanced scripting functions. Universal Robots is a result of years of intensive research in robotics. The six-axis robot arms weigh as little as 24 lbs. with reach capabilities of up to 51 inches. The product portfolio includes the collaborative UR3, UR5 and UR10 robot arms named after their payloads in kilos. Repeatability of +/- .004” allows quick precision handling of even microscopically small parts. After initial risk assessment, the collaborative Universal Robots can operate alongside human operators without safety guarding. If the robots come into contact with an employee, the built-in force control limits the forces at contact, adhering to the current safety requirements on force and torque limitations. www.universal-robots.com. The Miami based startup’s Service Pager is based on eleven unique patents and designed to last ten years without recharging or plugging in. Used in many different communication settings, the most widespread use is in restaurants where guests touch their smartphone to the disc, prompting an app to instantly appear on their phone. The app’s AI understands the queries and can translate into the native language of the recipient; if the guest ask for another round of drinks, it communicates with the bartender; if the guest wants her car, it communicates with the valet, etc. The solution has proven to double employee efficiency. Hirebotics’ mission is to make automation easy, affordable and within the grasp of manufacturers across all industries and of every size and type. The founders, Rob Goldiez and Matt Bush, launched the company in 2015 in Nashville and now have robotic workers deployed as hourly paid employees in Florida, Ohio, Michigan, New York, Wisconsin, Indiana and Tennessee. Hirebotics is a UR Certified System Integrator and works exclusively with UR robots. Although Hirebotics seeks long-term work, there is no long-term commitment. Hirebotics’ cobots are generally looking for 2 shift work with at least 80 hours a week – they don’t charge overtime and clients are only charged for the hours actually worked, which are monitored and billed through Hirebotics’ cloud-connected solution.